Managed social media accounts including Facebook, Twitter, Instagram, Periscope, and Vine. Grew organic Facebook weekly reach to over 250,000 and added 10,000 new followers. Assisted app users with social media tech support requests. Reviewed and quality controlled incoming photo submissions to MyRadar app. Assisted development in design and testing of Vizrt interactive weather software. Created video content using iPhone and iMovie. Anchored and produced weather for all weekend newscasts including weathercasts for 3 hours of morning news plus GMA cut-ins and 2 evening newscasts per day. Filled-in other days as needed. Anchored and produced weather for all weeknight newscasts while graphically animating the weather story telling process. Advocated for station severe/tropical weather plans. Presented long-form severe weather coverage. Transitioned graphics for HD conversion. Updated the website, blog, social media, telephone weather lines, and text message forecasts. Analyzed meteorological data for the Explorer of the Seas project. Evaluated All-Sky camera images and plotted data. Anchored and produced weather for weekend morning newscasts while filling-in for weekday morning and noon newscasts. 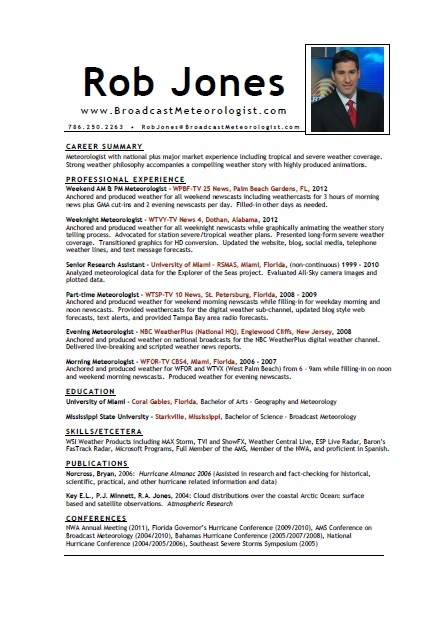 Provided weathercasts for the digital weather sub-channel, updated blog style web forecasts, text alerts, and provided Tampa Bay area radio forecasts. Anchored and produced weather on national broadcasts for the NBC WeatherPlus digital weather channel. Delivered live-breaking and scripted weather news reports. Anchored and produced weather for WFOR and WTVX (West Palm Beach) from 6 – 9am while filling-in on noon and weekend morning newscasts. Produced weather for evening newscasts. WSI Weather Products including TVI and ShowFX, Weather Central Live, ESP Live Radar, Baron’s FasTrack Radar, Vizrt Interactive Weather, iPhone, iMovie, Microsoft Programs, Full Member of the AMS, Member of the NWA, and proficient in Spanish. Szczodrak M., P.J. Minnett, K.A. Maillet, R.A. Jones, Comparative Measurements of Atmospheric Water Vapor Over the Oceans. AGU Ocean Sciences, Portland, Oregon, Jan 26-30, 2004. Key, E.L., P.J. Minnett, R.A. Jones, Cloud Modulation of Surface Radiative Heating Over Arctic Continental Shelves. AGU Ocean Sciences, Portland, Oregon, Jan 26-30, 2004.